Upplev det bästa av Islands brand, vatten och historia på en dagstur på Golden Circle i en bekväm minibuss. Ta i det tuffa, stensträngiga landskapet av Thingvellir National Park. Hör historier om Islands naturhistoria och kultur, eftersom du njuter av en vacker utsikt över landskapet runt Gullfoss vattenfall (105 meter). 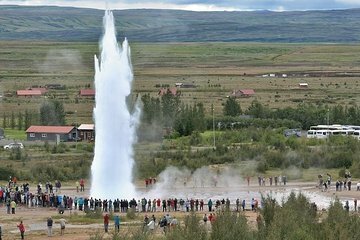 Gör ett sista stopp vid en aktiv geoterm zon för att se den ångande Strokkur-gejsaren innan du återvänder till Reykjavík. absolutely brilliant tour. great value for money. unique and informative with more locations than the usual tours and a fascinating and intelligent commentary. new, high spec. and comfortable minibus and smaller group sizes accomodating everyone's needs. the tour guide was caring and friendly. This tour was incredible! Having a small group of 10 made it intimate and easy to travel with everyone. We got to see sights we did not expect and our tour guide, Sveinbjorn, was so knowledgable and charismatic. This was by far our favorite and most eventful day in Iceland! This tour was amazing! Sven was knowledgeable, friendly and was able to adjust as our group needed. We wanted to stay ahead of the big busses and were able to do so without missing anything. Additional stops were added to see things we wanted. This is probably the best deal in Iceland. Other than seeing the northern lights, this was the best part of our trip. Thank you Sven!!! An absolutely fantastic tour. Definitely better than expected. Sven was a brilliant guide, very knowledgeable and kind. We saw everything that was booked via the tour and more. Iceland has an incredible history that we would never have learned if it wasn't for this tour. A definite must. Sveinbjorn, our guide and owner of the company for the day was friendly, knowledgable and obviously proud to live in Iceland. There were just four of us on the tour and our early start meant we got to each destination before the large coaches which made it so much more enjoyable. The tour included places that the larger tour company's do not offer, we even stopped on the side of the road to feed the Icelandic horses on the drive back to Reykjavik. I loved their fluffy ears!! From the volcanic crater, to the meeting of the tectonic plates to the beautiful little church in Icelands first town, the Strokkur geyser, Thingvellir National Park and Gullfoss waterfall it was truly an amazing day and we learnt so much about Iceland, the people, the history and the landscape. Sveinbjorn is a superb guide and I would highly recommend this tour which was excellent value for money. The mini bus was very luxurious as well. This tour exceeded my expectations. We mainly booked it to see the Waterfall and Geyser however Sveinbjorn, our guide, really went out of his way to show us unique and wonderful parts of the Icelandic terrain. 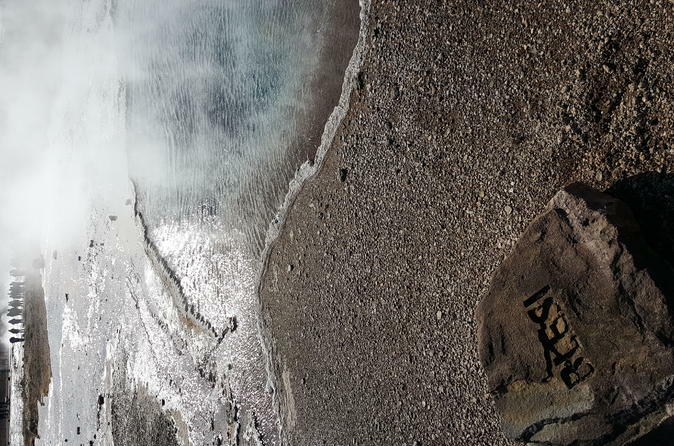 We walked inside an inactive volcano, stroked wild horses and learnt some interesting history! and offered minimal guidance as to where to best view the attraction or what special things to look for. All four of us were somewhat underwhelmed and a bit disappointed when we returned to the hotel less than seven hours into it. Sven sp was wonderful! He was kind, and informative - a walking encyclopedia! The trip was worth every penny plus some. My mom is handicapped and he went out of his way to make her feel comfortable. would def recommend this tour!